So money is tight and you can only afford to take in one or two of the bands at this weekend's Last Fling festival in Naperville. 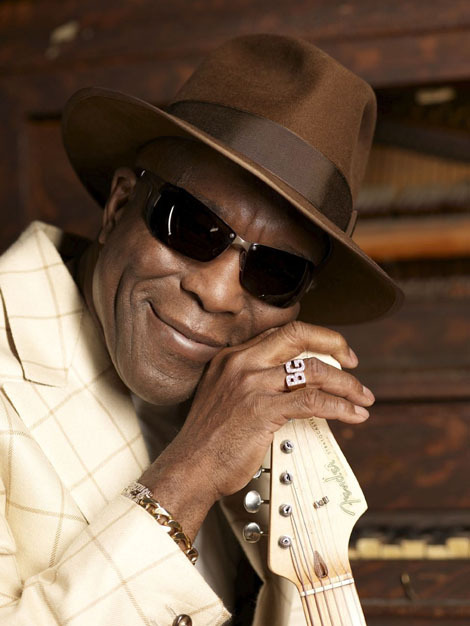 Well, 74-year-old blues legend and Chicago treasure Buddy Guy is a sure bet. He will take the stage at 8 p.m. Friday, but get there early, because you won't want to miss opening act Moreland & Arbuckle, who play a sweltering blend of blues and rock. Southern rockers Collective Soul also are a band not to miss live. When I saw Collective Soul in Naperville, frontman Ed Roland was running around on stage like he was performing for the first time. Catch the band from 8 to 10 p.m. Saturday. Tickets are $15, and are available at several area stores. But the festival offers plenty of free entertainment as well. A full schedule is available at www.lastfling.org. The band - comprised of Rachel Nagy on vocals and Mary Ramirez on guitar - formed in 1994 and is currently working on a new album for Chicago-based label Bloodshot Records. The Detroit Cobras will perform Sept. 4 at Durty Nellie's, 180 N. Smith St., Palatine, www.durtynellies.com. The Honeybees, www.myspace.com/thehoneybees, are also on the bill. The show starts at 9 p.m., and there is a $10 cover charge. I had the chance to interview Ramirez about what the band is doing these days. Q - I see you guys are working on a new album. We haven't actually started recording it, we're just getting the material ready for it. Q - How is the process going? Do you have any goals for the new album? It's going to be a rockin' kind of album. I don't think we are trying to go in a different direction as much as we want to make it a little more rockin' this time around. Q - How do you pick the songs that you want to remake, that you want to put your own stamp on? It's like deciding what you are going to wear for the night. You are looking for a certain kind of feel, but that changes all the time. Q - What did you listen to growing up? I listened to a lot of soul. My mother was into a lot of soul and stuff, and then you break out on your own when you have money. Q - What makes your collaboration with Rachel so good? How do you guys get along so well? I guess we're lucky in that respect. We think a lot alike. I love the same kind of music. Q - How does that work out? Do you both throw out ideas? In Detroit, there's a lot of places where you can buy cheap records. You sit around and listen with your friends. Basically there's a lot of drinking and listening. We have a lot of people giving us suggestions. We draw from wherever we can. Q - Are you guys doing new songs on the road? I try not to. I don't want to try anything new on the road before I have it down on record. Q - Meg White from The White Stripes has a cameo in the video for "Cha Cha Twist." Do you guys know each other well? How did that collaboration come about? Everybody knows everybody here. Detroit is a small city. There are pockets of people. Q - A lot of people refer to you guys as a garage rock band. Do you like that label? Do you think it fits? To me, we play rock 'n' roll. Sometimes when people say garage rock band, you think it is low fi or something. I've used the term myself. If the Stones were coming out today, would they be considered a garage band? Probably. 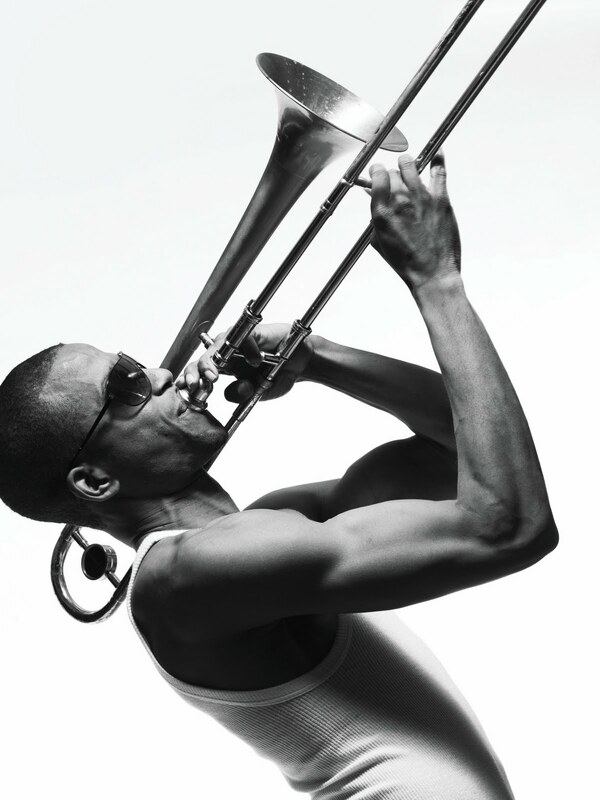 Those who were upset that Trombone Shorty's set in June at the Blues On The Fox festival in Aurora was cut short because of an incoming storm will have another chance to see him at On The Waterfront festival in Rockford. Shorty and his band Orleans Avenue will perform from 5:30 to 7:45 p.m. Sept. 5 on the Verizon Wireless Left Bank Stage. More information is available at www.onthewaterfront.com. The 24-year-old New Orleans trombone and trumpet player - born Troy Andrews in the Treme neighborhood in New Orlean's 6th Ward - has become more of a household name this year with his appearances on HBO's Emmy-nominated show "Treme," and the release of his CD "Backatown," which entered the Contemporary Jazz Album chart at number one and spent nine weeks there. His song "Hurricane Season" is the opening title song on MTV's "The Real World: New Orleans." In October, he will join the legendary Jeff Beck on his U.K. tour. I had the chance to talk to Shorty about his banner year and what it was like to play alongside Bo Diddley at the tender age of 4. Q - I saw you in downtown Aurora in June. It's too bad they had to cut it short because of the incoming storm.You had the crowd going. We were just getting going. We had a lot of music we wanted to lay on everybody. Q - You guys just played in Brazil. How was that experience? That was amazing. We played at a festival. This guy is in love with New Orleans and he created this festival called the Bourbon Street Festival. He brought us down and we headlined. He has a club called the Bourbon Street Club and we went to play in front of 20,000 people on the street. It was really fun. Even though people couldn't really understand what I was saying, they enjoyed the music, and they were reacting to the sound and different textures. Q - Speaking of New Orleans, you made four appearances on the show "Treme" this past year. Do you think the show is putting the spotlight back on New Orleans? French Quarter. I think it is definitely helping. You have millions of people watching it. They really get to see what we go through every day. I'm trying my best to represent the city as well as I can. Plus, the show is helping musically. It's the most non-commercial music that we have on TV. Q - Is it even more special for you to be on the show because you grew up in Treme? Anytime you get to be on TV representing what you love is always a special thing. I'm part of the rebuilding process. The way I can help is through music. Q - This has been a huge year for you. Did you think when the year started that you would have all these opportunities? I didn't even think about it. I've been playing so long that the only thing I know how to do is just play and different things happen. It's wonderful. I just want to continue it and keep it going. We get a lot of love from people, that's what is most exciting. That's my inspiration to keep going. Q - It seems like your career started out with a bang, playing with Bo Diddley at age four. Do you have vivid memories of that? even know if I was doing the right thing. Q - Do you remember him giving you any advice? The only thing I remember is that he was looking at me and saying, "Blow. Blow the horn." Q - "Backatown" features a number of guest musicians, such as Lenny Kravitz, Allen Toussaint and Mark Broussard, and it was produced by Galatic's Ben Ellman. Was this kind of like your dream team? I wanted to work with these people because they are some of my favorite musicians and artists that I listen to on a regular basis. I played with these genius musicians and they helped me out as a kid. Q - What did Ben Ellman bring to the table? 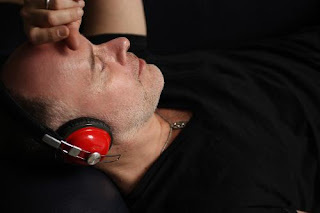 I thought he was a great choice to produce the record because he understood the live aspect of Galactic. I thought he would be the one person who could understand how we could translate the live energy to the record and still make a decent album to where people can fall in love with the songs even if they never heard us before. Q - You've played with so many people already. Do you have any dream collaborations? Yeah, I want to collaborate with Stevie Wonder, B.B. King, Jay-Z and Little Richard. I've listened to all those people and I'm inspired by them. I just really want to do something with them. Q - You call your music Supafunkrock. Is that a reflection of your musical influences? Supafunkrock is basically high energy, its funky, its rocking, it's just a musical gumbo. People used to ask us what kind of music we play. It's not really jazz, it's not really blues, it's not really funk, it's not really hip hop. There are so many things rolled into one, that we just call itSupafunkrock. To me, music is music. Putting a label on it only helps sell and market it. Q - You are a trombone and trumpet player and are leading a band. Do you see yourself breaking ground? I don't know. In New Orleans, we have people who play the washboard who lead bands. It's something I've done all my life. George Thorogood and his band The Destroyers do not need lasers or dancers to entertain an audience. They proved that in convincing fashion Saturday night at the House of Blues in Chicago. Thorogood and his band quickly won over the Chicago crowd when they blasted out a sweaty version of the Bo Diddley classic, "Who Do You Love," as their second song of the night. It also didn't hurt that Thorogood during the show declared Chicago to be the "heart of America." The 60-year-old Thorogood commanded the stage with the energy of a man half his age, running from one end of the stage to the other as he greeted his grateful fans. Although the majority of those fans were age 40 or older, younger faces were in the crowd as well, showing the power of Thorogood's music. The audience lit up when he tore into his hits, such as "I Drink Alone," "One Bourbon, One Scotch, One Beer," and "Bad To The Bone." Those in the audience included Chicago blues legend Lonnie Brooks, who was hard to miss in his trademark 10-gallon cowboy hat. In an ideal word, Brooks would have jumped on stage and get into a guitar duel with Thorogood. But hopefully that will happen the next time Thorogood comes to town. For those who miss smart, melodic pop, there's new good news: The Posies will release its first album in five years, "Blood/Candy," on Sept. 28 on Ryko. Peter Gabriel put his trademark introspection into the song "Mercy Street." Fever Ray - aka Karin Dreijer Andersson of The Knife - has turned in an hauntingly beautiful cover of "Mercy Street," more than doing justice to the song. The song is set for release on Sept. 14 as a digital download through Mute in the United States and Canada. Fans who can't wait that long to hear the song can stream the track by visiting www.soundcloud.com/fever-ray/mercy-street. As she puts it, "It's an interpretation of Peter Gabriel's 'Mercy Street'. We made it more intense and faster to fit our excentric pecussionists and energetic live musicians. It is a monotone track but we worked with the dynamics trying to make it sparkle. I listened to it a lot when I was around 15, and it still moves me. It made me start reading Anne Sexton too." Those who come to the 2010 Concert for a Cure on Aug. 28 will be treated to some of the best local music in the Chicago area while supporting a good cause. The band HOSS will be joined by The Antennas, the Dallas Motorcade, Dave Ramont & Friends, The Future Burns, Gallery, Gabe Perez, Greg Boerner, Hix Bros Junior All-Stars, the Michael Heaton Band, Noah Gabriel (& band), and The Wandering Endorphin. The concert will take place from 2 to 11 p.m. at Tanna Farms Golf Course, 39W808 Hughes Road, Geneva. Gates open at 1 p.m. The 2010 Concert for a Cure is the 4th annual event for the Paul Ruby Foundation. This non-profit raises money to combat Parkinson's disease, funding research projects connected to finding a cure. In three years, the foundation has raised more than $200,000. Tickets are $25 for those 21 and older, $10 for under 21. Ages 2 and under are free. Tickets are available at Kiss the Sky in Geneva or online at www.paulrubyfoundation.org. While Lollapalooza has pulled out of town, another festival is getting ready to entertain the masses. Nas and Damian "Jr. Gong" Marley are among the diverse mix of artists that will hit the stage Sept. 3-5 as part of the North Coast Festival at Union Park in Chicago. Three-day passes to the festival are $75, and single-day passes are $35, available at www.clubtix.net. Just in time for his Aug. 25 show at Millennium Park in Chicago, UK artist David Gray today released a new studio album, "Foundling," on Mercer Street Records/Downtown Music. The two-disc set features the full length album and a nine-song bonus disc featuring never before released material. Gray will appear at Millennium Park as part of a co-headlining summer tour with Ray LaMontagne. Those Gray fans who can't wait for the show can tune into CBS' "The Early Show" on Friday, when he will perform a free concert on the network's plaza. Tickets to the Millennium Park show range from $20 to $75, and can be found at www.ticketmaster.com. The blues capitol of the world has a new blues label. New Chicago-based blues label SWISSISSIPPI RECORDS will release three CDs on Sept. 21 - Chris Harper's "Four Aces and a Harp" (also featuring Jimmy Burns, John Primer, Willie "Big Eyes" Smith and Bob Stroger), Rob Blaine's "Big Otis Blues" and Peaches Staten's "Live At Legends." The Swississippi name signifies the international reach and multi-forum approach Zurich, Switzerland native CEO Chris Harper and Chicago-born general manager Dave Katzman are utilizing with the label. "Even the name suggests what we're about, which is retaining the feel and sensibility of the classic blues sound, but putting fresh things on it," Harper said. For the new venture, CEO/harmonica player/bandleader Harper teamed with general manager/guitar player/production company owner Dave Katzman. For 20 years, Switzerland native Harper owned and ran the #1 convention display company in Switzerland until he sold the business to pursue his passion for playing blues harmonica. Chicago-born Katzman's lengthy tenure inside the music business involved everything from artist management to production manager at the original Buddy Guy's Legends to sideman. Katzman readily acknowledges that starting a new record label goes aganst the grain in terms of conventional thinking regarding 21st century industry practices. "Yes, there are all kinds of good reasons for not starting a record label, but there's one major one that really influenced both of us," Katzman said. "There are a lot of outstanding traditional blues musicians who aren't being recorded for whatever reasons. I've worked with many of the current blues labels and I know and respect all those people, but it seems the marketplace has reached the point where in many cases companies aren't willing to take chances on artists." "What we're doing with Swississippi is going out and recording these performers, making sure everything we release is high caliber across the board, and working the albums in all forums and sites," Katman said. We'll be doing retail, digital, using the Internet, emphasizing tours, building audiences at home and abroad, in short using every possible method to build audiences and expand the profile of our acts." Read more about the label at its Facebook page. George Thorogood is not the type of musician to look back. He does not reflect wistfully on the recent release of the CD, "George Thorogood and the Destroyers: Live in Boston 1982." Thorogood also likes to joke around, including making fun of himself and his past baseball career. About the only thing that Thorogood takes seriously is his music. 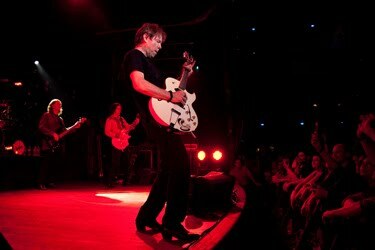 Thorogood and his band will perform Saturday at the House of Blues, 329 N. Dearborn, Chicago. Also on the bill is noted Chicago saxophonist Eddie Shaw, whose prestigious musical background includes stints with Little Milton, Muddy Waters and Howlin' Wolf. The show starts at 7:30 p.m., and tickets are $45.50 in advance, $47.50 the day of the show, available through www.livenation.com. I had the chance to talk to Thorogood about a variety of topics, including his feelings about the new CD. Q - So I see you are coming to the House of Blues. Yeah, for the umpteenth time. George Thorogood in the House of Blues is like putting Billy Williams in Wrigley Field. It's a good fit. Q - How did you meet Eddie Shaw? I remember him well before he remembered me. Our band would open for Howlin' Wolf in 1974. I got to know the guys in the band pretty good. I got to know Hubert Sumlin pretty well and Detroit Junior. I didn't know Eddie real well then because Eddie was the leader of the band and he was very busy taking care of Wolf, who had health problems. Eddie also had normal band duties to take care of, you know paying the band, making sure certain guys didn't drink too much. He was very busy. But I paid a lot of attention to Eddie. I learned a lot from him about how to be a band leader. We finally hooked up again 10 years ago, 12 years ago. We were reunited in a way. Q - That must have been an honor to meet Howlin' Wolf. I was long gone on his music long before I met Eddie. I was a Howlin' Wolf freak back in 1966. He was pretty much on his last legs when he met. He died in January 1976. He wasn't long for the world. So I was fortunate enough to catch him not only at the end of his career, but his life. Rounder just released "Live In Boston 1982." I was just listening to it, and it's really energetic, it still sounds fresh to this day. Are you happy that it's out there for people? It's better to have something than nothing. Rounder is a very heritage minded label. Me, I'm like, we did that an an hour ago, come on, let's move on. Q - It seemed like you guys were really clicking back then. You guys had just come off a tour with the Rolling Stones. We're clicking now. I was just finding my way around back then. MTV was in its infancy at that point. It was a very exciting time, the early 1980s. The '80s at that time was the new '60s. The '70s were kind of drab, and all these bands kept popping up in the late '70s, like Tom Petty and Bruce Springsteen. All these bands grew up on the '60s music. Everybody was kind of feeling their '60s roots. At that time, I didn't know if I was going to be a blues band or a rock band. I'm kind of stuck in between somewhere. The money is in rock, buddy. Q - What do you think of the music business these days? It's gone through a lot of changes over the years. Every business is changing. The television industry has changed. The movie industry has changed. Sports has changed. You have to keep up with it, or you will be out. It's just like anything else. Where something is lost, something is gained. You put lights at Wrigley Field, didn't you? That's as far as it went, though. You still don't got the World Series. And I don't think that's going to happen this year. It's not going to happen until you get some pitchers. Pitching wins pennants. Q - Speaking of baseball, do you have any regrets of not continuing in your baseball career? I had no baseball career. What are you taking about? Are you the owner of a team? Where were you in 1968? I could have gone farther? Where did you get this information? (Of course, Thorogood was snickering a little during this part of the conversation). Q - How did you make the switch to being a musician? There was no switch. That's what I wanted to do from day one. Well, actually I danced around with ideas of being a comic when I was young after seeing Jackie Gleason and ErnieKovacs and Red Skeleton. I was very into that. My mother anyway thought that might be the way I was going to go. And then I saw this skinny guy with big lips singing, "(I Can't Get No) Satisfaction," and I went, 'Hey, that guy's funny. Hold the phone.' I got hooked, like the whole world did. The wait is almost over for fans of Weezer. The Grammy winning band plans to release a new studio album entitled "Hurley" on Sept. 14 on Epitaph Records. Fans can pre-order the physical album now at www.EpitaphStore.com or on www.Amazon.com. The album's first single, "Memories," can be streamed now at www.MySpace.com. "I've been a fan of Weezer from the beginning, and I've loved all their records," Epitaph president and founder Brett Gurewitz said. "So it's amazing to find myself working with them on the new one!" Labelmate and Rancid frontman Tim Armstrong chimed in with his own thoughts. "Weezer is a great band," Armstrong said. "I'm stoked they're going to be part of the Epitaph family." Stay tuned to www.weezer.com and www.epitaph.com for up-to-date news and information about Hurley and the band's soon to be announced fall tour. The lineup keeps getting bigger for the 25th edition of Farm Aid on Oct. 2 at Miller Park in Milwaukee, Wis. It was announced today that Kenny Chesney, Norah Jones, Jason Mraz, Jeff Tweedy, Band of Horses, The BoDeans, Amos Lee and Robert Francis will join Farm Aid board members Willie Nelson, Neil Young, John Mellencamp and Dave Matthews at Farm Aid 25: Growing Hope for America. The show will be broadcast live on DirecTV. Farm Aid’s mission is to build a vibrant, family farm-centered system of agriculture in America. Farm Aid artists and board members Willie Nelson, Neil Young, John Mellencamp and Dave Matthews host an annual concert to raise funds to support Farm Aid’s work with family farmers and to inspire people to choose family farm food. Styx is getting ready to head out on the U.S. concert trail again this year. Along with the classic hits, the beloved Chicago band will be performing 1977's "The Grand Illusion" and 1978's "Pieces Of Eight" in their entirety. Styx will perform Oct. 15 at Star Plaza Theatre in Merrillville, Ind., and Genesee Theatre on Oct. 16 in Waukegan. Tickets for both shows will go on sale Saturday. A seven-song EP, entitled "Regeneration, Volume 1" containing six newly re-recorded classics - "Come Sail Away,” "Crystal Ball," "Fooling Yourself (The Angry Young Man),” “Lorelei,” “The Grand Illusion” and “Sing For The Day” - and a brand new track, “Difference In The World,” will be available for sale at every stop along “The Grand Illusion/Pieces Of Eight” October/November tour route. Over the course of their 38-year career they’ve released 15 studio albums, 6 best-of compilations and 4 live albums, garnering 8 Top Ten singles. Styx has sold more than 30 million albums worldwide. Marc Cohn talks about "Walking in Memphis"
The year 1970 provided a musical feast for a young Marc Cohn. The then 11-year-old was introduced to such artists as Cat Stevens, John Lennon, Van Morrison and others that year. Cohn, best known for the hit song "Walking in Memphis," pays homage to those artists and others on his latest CD, "Listening Booth: 1970." Cohn endured a scary moment in 2005 after being shot in the head by a would-be carjacker. Fortunately, the bullet did not penetrate his skull. He will perform with Bettye LaVette Aug. 8 at The Morton Arboretum, 4100 Route 53, Lisle. The show starts at 7 p.m., and tickets are $34 in advance, $36 the day of the show, available by calling 630-725-2066. I had the chance to talk to him about his new album and his inspiration for writing "Walking in Memphis." Q- So I understand 1970 was a important year for you musically. Music resonates deeply and belongs with you for a long time. There was so much music that came out that year. It was a huge year for music. Q - What goals did you have for the album? I wanted to write it thematically, and not just make it 'Marc plays his favorites.' We looked at whether we could find a fresh approach into the song, and did I sound good singing the song. As an artist, I want to deconstruct a song and find a new way in. Some of my favorites I had to leave off in the end. Some of them are favorites and some of them are just songs from 1970. Q- It seems like a lot of artists these days are revisiting the past. This is quite different from a covers album. Those arrangements have nothing to do with the originals. Q- How did the 2005 incident affect you and your work? I had a lot of post traumatic stress to work through. After that, I found a new appreciation for my audience and I felt more motivated to work. I felt much more engaged and motivated to play and write and record. Q - Did you realize when you wrote "Walking in Memphis" that the song would connect with people the way it has? I knew it was a good song and that I had turned a corner as a songwriter. I had no idea that it would become a hit when it came out. Q - I understand that you were inspired to write the song after hearing Al Green deliver a sermon. He's always been one of my favorite singers. To hear him in that context, it was incredibly moving. He is a big part of what inspired the song. Q - And then you got to sing with him. I went on stage once with him, to sing "Let's Stay Together" at a show in Memphis. I was floating on air several days afterwards. He's one of the greatest singers that has ever lived. It was a thrill of a lifetime. Q - Do you have any dream collaborations? I've been pretty lucky. I've already had a lot of dream collaborations with people like James Taylor, Bonnie Raitt, Jackson Browne and David Crosby. There are a lot of people I would still like to play with like Mavis Staples, Joni Mitchell and Paul McCartney.